The interwebs have been aflutter all day with analysis of Campbell Brown's Colbert Report appearance last night. You can read about it here, here and here. One of the big questions that has surfaced is "Why won't Brown reveal her donors?". While I agree it would be interesting to know, and nobody likes sifting through this kind of stuff more than me, I'm writing today to tell you, in this particular case, we really don't even need to know. 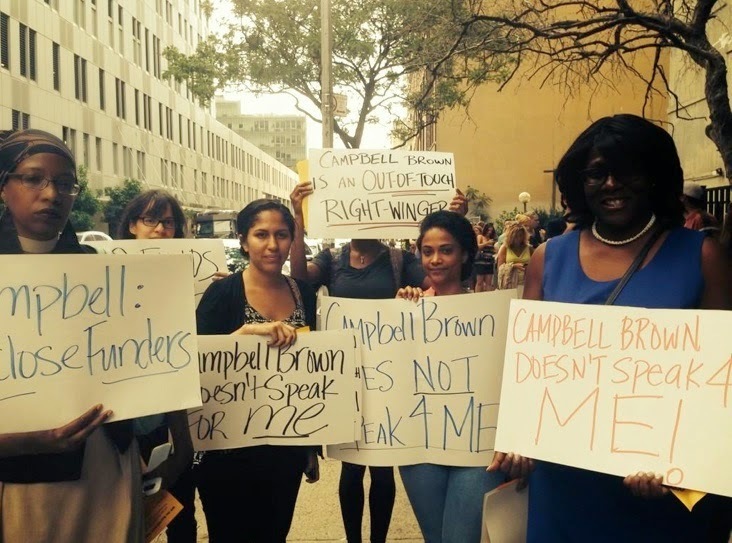 Campbell was silly enough to pretend the reason she can't reveal her donors is because she has to protect them from people like the oh-so-scary protesters outside the studio. Twenty folks who look like you and me. Ooo, is that scary! I mean, look at these thugs, what with their magic-markered poster boards and their peaceful milling around on the sidewalk! No wonder Campbell won't say who is financing her operation -- clearly, these parents who are "trying to silence debate" are "going to go after people who are funding this"! And by "go after," I guess Brown means "hold up hand-made signs"! Clearly, we must protect Brown's plutocratic backers from this danger at all costs -- including any normal standards of transparency. It's preposterous to even entertain the notion that the people in the picture above pose any real threat to Campbell Brown or any of her donors. It seems far more likely that if her donors are revealed it will become painfully clear that the lawsuit is simply not for "THE CHILDREN". I've already taken a look at the Board of Directors of Brown's new outfit, Partners for Educational Justice, which brings together reformy heavyweights from groups like StudentsFirstNY, DFER and NYCAN, and all the money, power, and influence behind those groups. But I'm embarrassed to say, I missed a HUGE piece of the puzzle. In my last post I described Brown's husband, Dan Senor, as a board member for StudentsFirstNY and a former advisor for Mitt Romney. But I missed two gigantic parts of his backstory. Senor first came to prominence as a spokesman for the Coalition Provisional Authority in Iraq in the aftermath of the 2003 U.S.-led invasion, gaining a reputation as "the spinmeister responsible for selling the early years of the occupation … as a rosy time—even as bombs exploded daily and sectarian violence ripped apart the country." So Brown's husband is a wartime spinmeister, education reformer, AND a Wall Street hedge fund guy? How did I miss that?!? 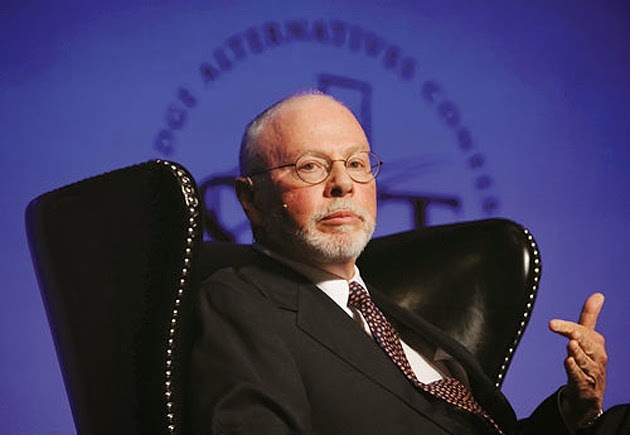 And who is Paul SInger, the guy who was able to lure Senor away from the investment firm he co-founded? Check out how Singer makes his money. Mr. Singer is perhaps best known for the fight he put up — and the money he made — in his battle over Peruvian debt. In 1996, he paid $11.4 million for $20 million worth of discounted, government-backed Peruvian bank debt. Then, rather than joining with 180 other Peruvian creditors who agreed to a plan using bonds to forgive some of the impoverished country’s debt, Mr. Singer held out for bigger payments. He battled in the courts. At one point he hired an Albany lobbying firm and got New York State to change an obscure law to strengthen his position. When the dust had settled, Mr. Singer ended up getting $58 million for his Peruvian investment. Excuse me, but HOLY S%&*!! Reading about Singer's practices in poor, distressed countries around the world is horrific. This is from truthout and Democracy Now!. You know, right now what’s happening in this particular case is now these vulture funds have been equipped with an instrument that’s going to force poor countries, like the Ivory Coast and Zambia, into submission. So it’s a very powerful precedent that will be impacting the one-out-of-five people that live in extreme poverty around the world. AMY GOODMAN: Can you talk, Eric LeCompte, very quickly, in 30 seconds, about Paul Singer, who is the head of the parent company of NML? ERIC LECOMPTE: So, essentially, he’s the person that’s developed this predatory behavior, that goes after assets in poor countries that essentially belong to vulnerable communities. He’s the person that leads several firms that are these predatory hedge funds which engage in this exploitative, extreme behavior. And he’s popularized, essentially, this kind of investor action around the world. And right now the World Bank notes that there are about a hundred companies that follow, essentially, the leadership that Paul Singer has laid out in terms of this behavior. AMY GOODMAN: And his significance in national politics? Five seconds. Senor and Singer are some seriously scary dudes. There is simply no way they are going to be intimidated by a small clutch of protesters milling around outside Colbert's studio, but that was one hell of an act Brown put on! Singer, and presumably Brown's husband, take on entire countries for heaven's sake! And what does it tell us that Paul Singer, the guy who "popularized" the practice of exploiting entire distressed countries, is a well known backer of Eva Moskowitz's Success Academy? 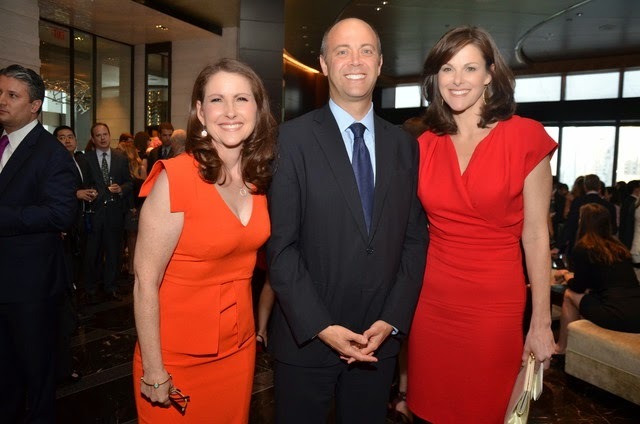 And oh yeah, Campbell Brown just happens to be on their Board of Directors. The guest list for last year's inaugural Success Academy gala is wild. 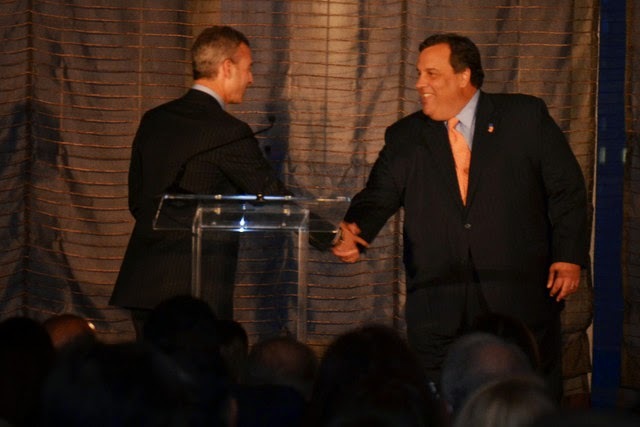 Daniel S. Loeb put aside discussions with Sony Corp. last night to be the first honoree at the first gala for Success Academy Charter Schools. With a “no counterparty left behind” philosophy, and feeling “a little bit like Don Fanucci” in “The Godfather,” as he put it, Loeb, the chief executive officer of Third Point LLC, rallied impressive support from the financial-services industry. David Einhorn, Paul Tudor Jones, Rich Handler and John Griffin were at his table; David Tepper, Paul Singer and Scott Bommer were at others, all decorated with “Success” pencils. 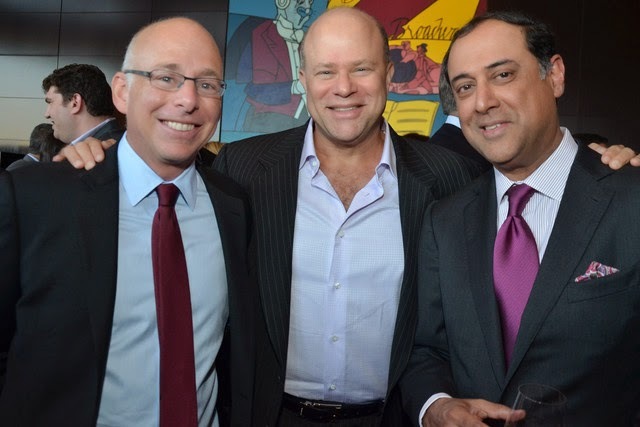 And who can resist a David Tepper sighting? Especially when we're talking about tenure! 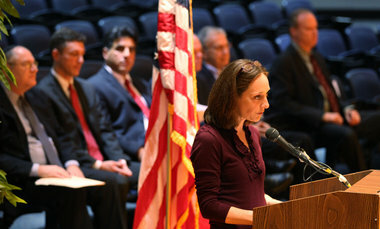 Check out the rest of the gala pics in the link above. It's quite illuminating. Charter school galas sure can bring out a whole heck of a lot of guys with a whole heck of a lot of money! Will I keep digging around to find out exactly who is financially backing Brown's lawsuit? You bet I will. But in reality, it really doesn't matter much. That Brown would feign that she can't disclose her donors to protect them from moms like me or the ladies outside Colbert's studio is preposterous. I have a blog, they have signs and sharpies, and Brown has at her beck and call the main stream media, a well seasoned PR machine, high-powered lawyers, and guys worth $1.5 billion. The smart money says she won't reveal her donors because some are likely "passionate defenders of the 1%" like Singer (and her husband) who are willing to plunder poor countries all over the world, which, ya know, happen to be full of children. Sure would make it harder to pretend you're trying to gut the union and get rid of tenure "for the kids", wouldn't it? Oh, I'm sorry Ms. Brown, is this the kind of targeting of your potential donors you were worried about?